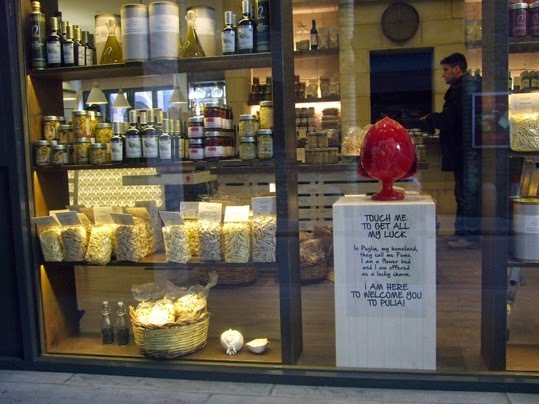 Passing through Borough Market - the wonderful food market near London Bridge - the other day, I saw this good luck charm in the window of an Italian cafe called Pulia. I had to stop to have a look and take this photo. The good luck charm is a ceramic flower bud and is called a pumo. The sign invites people to touch it so that good luck rubs off. Doing a bit of research, I found out the pumo comes from the Italian region of Puglia, where the ceramic ornament apparently appears everywhere - adorning the outside of buildings as well as in kitchens and windows. Although the pumo in the cafe was in the shape of a flowerbud, I've learnt that others are in the form of acorns or pine cone buds. The plural of pumo is puma. The charm is thought to date back to pagan times and was a symbol of the goddess of fruitfulness Pomona. In Puglia, puma are traditionally given as wedding gifts or to bestow good luck on a new home. Nowadays, many are sold as souvenirs to tourists.